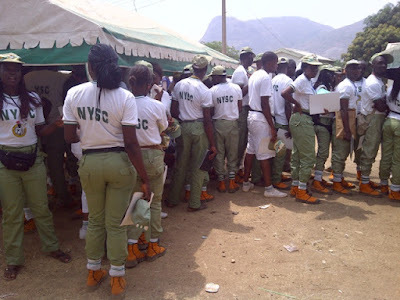 From clearance in school to being shortlisted for service, from being shortlisted for service to being called up and issued the letter, from receiving the letter to knowing the state of primary assignment, from knowing the state to getting prepared to locate the particular orientation camp, from locating the camp to scampering to get accommodation space in the dormitories, from scampering for space to getting registered to get code numbers, from registering to locating either the kitchen or mammy market are some of the introductory activities an NYSC otondo goes through. Then back to base to rest, it is the anthem telling you to obey the clarion call at 4:00am. Obeying the clarion call is a thing of adequate and immediate action which is based on absolute youthful agility. Once it is sounded, the immediacy in its rhythmic melody would have no choice but to stand you up from your six inches bed and then send you, racing like a wounded tiger, down to the parade ground holding your white tennis canvass in one hand (perhaps trying to put them on), and your bank (waist bag) on the other hand and at the same time trying to dodge a whip from any of the soldiers and the man o’ war guys. As you try to keep a date with the clarion, and possibly trying to double up, you still get to meet its tides racing down your brains which now reminds you of its powerful subconscious command when you hear the sound it projects, and then, you wouldn’t forget your reason for being in a basin of unbreakable walls, which is, service to humanity via National Youth Service Corps (NYSC). Robert Greenleaf, an educator and writer says that he believes that serving and being served are reciprocal and that one cannot really be one without the other. It’s a call to serve the Nigerian nation in a paramilitary form. We came, we saw, we served, we strived, we survived and we conquered the fears that enveloped us in twelve months. To some, it was as if it will not end. It kept lingering on making us convert twelve months to twelve years. This happens especially when you find yourself in a place that is never gratifying and to a large extent, is inevitably uncomfortable. Of course we were served with absolute respect. But then, can we say the respect left any indelible mark on us for future recognition or even recommendation? Dr. Martin Luther King, Jr. once said that the true meaning of leadership is service. I believe many of us in one way or the other have been able to show that we are leaders during this service year because we may have carried out certain functions on behalf of others. However, now that we have answered the clarion call what next? Are you Going back home to wait for call to attend interviews for a job offer? Oh! You already got one? Or do you want to further? Do you want to go professional? Have you started already? Oh! You are Self-employed? Whichever one, my question is what value have you added to your unique self during the national youth service year? I trust you guys. It is quite glaring that we met so many things undone in the communities we found ourselves during service, we left things undone as well. It may not be our job to finish the work, but we are not free to walk away from it as we go into the larger society. This is because as we left, they still stare us in the face. So we are not free from them because we cannot pretend not to know about the anomalies. We have served, it means we are great. We shall one day come back to these communities for a bigger service to plant sustainable developments. We give thanks to Almighty God for all His benefits that reign in our lives and for seeing us through this service year as we pass out today June 14, 2012. And I say may the souls of those corps members that died during this service year rest in perfect peace. Amen! AAAAAAAAJHUUUUWAAAAYAAAA!